(Family Features) If the ultimate goal of your home improvement project is aesthetic, the greatest benefit may come from your personal enjoyment of the new space. However, if you’re looking to add true value to your home, it’s important to consider which projects are likely to bring the greatest return on your investment. Much like hands reveal a person’s true age, flooring speaks volumes about a home. Replacing and updating worn floors can instantly add value. A timeless selection like wood flooring, particularly in heavy traffic areas, is durable enough to withstand wear and complements a wide range of interior designs. If you already have wood floors that are in reasonably good condition, whether in use or under the carpet, go ahead and refinish them for a budget-friendly alternative to installing new flooring. Another option that holds or even increases the value of your investment is tile, particularly in spaces like kitchens, bathrooms and laundry areas. Re-roofing a home gives it an instant value boost, but it’s a job that needs to be repeated periodically. One longer-term and on-trend alternative to traditional roofing is metal. Performance is the big selling point for metal roofs, but not only does the roof itself increase the home’s value, the safety benefits and peace of mind that come with knowing strong, fire-resistant metal roofs can last forever only add to the benefits. With a variety of styles available, you can find a metal roof to match nearly any home style. For example, CertainTeed Metal Roofing offers profiles crafted to simulate Spanish barrel tile, slate, and wood shake. 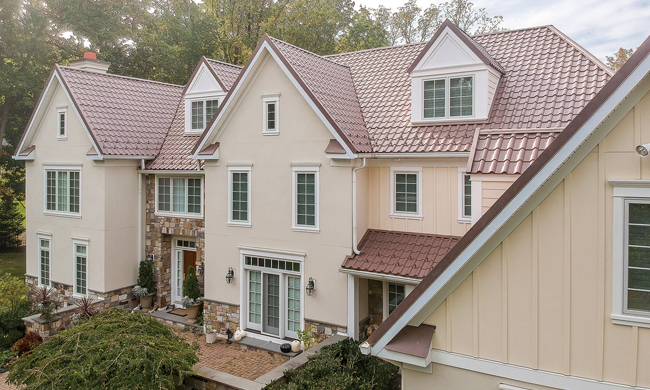 Made from high-performance, deep-drawn steel, these roofing systems offer a lifetime-limited warranty and are engineered with a special multi-layered paint process that resists the elements while offering realistic color details and gradations. Find inspiration and explore a design gallery at CertainTeed.com. Curb appeal often counts for a lot, whether it’s for your own enjoyment or a potential future buyer. Enhancing your home’s exterior can pay off handsomely when you add vegetation and hardscaping that improve the overall aesthetic. Keep in mind that more unconventional styles are better reserved for private spaces like the backyard; for the street view, stick to a motif with broad appeal to garner the strongest return on your investment. An outdated entry point isn’t just an eyesore; it can pose a security risk and even be the source of significant energy loss for your home. Replacing front doors and even garage doors can both bring a return on your investment and potentially start saving you money right away on heating and cooling costs. A new, properly installed entry door is likely to fit more snugly and allow for fewer air leaks. In addition, a heavier door and frame is more likely to stand up against forced entry. It may not be glamorous, or even anything that you’ll see on a regular basis, but many experts agree that upgrading your insulation is a sound investment. In addition to adding value in terms of comfort and reduced energy costs, it’s an attractive selling point should you choose to list your home. Awesome post. Everything you wrote here is insightful and on point. For home improvements with high ROI, you need to ensure that everything is pristine and repaired. Kudos to you for posting this. I definitely agree with this 100%. If you really want to have the right value for your home, you have to ensure that everything is repaired especially the roof.